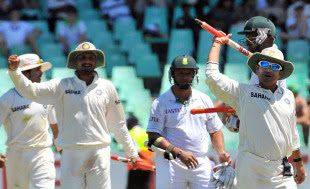 India beats South Africa at Kingsmead,Durban by 87 runs to secure the test match and squaring series 1-1. South Africa were all out for 215 on the fourth day chasing a target of 303 runs. The match between India and South Africa was evenly poised on the fourth day as South Africa need only 192 runs to win the series whereas India need seven wickets to level the series. South Africa resumed their inning on 111 for 3. They were scoring runs at more than five runs per over and when it looked that the chase would be over quickly, Sreesanth struck in the last over before tea with a short ball taking the wicket of Jacques Kallis. Sreesanth bowled a wonderful spell of five overs in the morning, taking one wicket for seven runs; he didn't offer the batsmen anything, while maintaining a good line and length. Few overs later Harbhajan struck by taking the wicket of AB De villiers. He was given out leg before wicket by Asad Rauf. He was unhappy at the decision taken by the Pakistani umpire as replays showed that the ball was going to miss the stumps. Harbhajan Singh and Zaheer Khan were the highlight of the day, as they dominated the Kingsmead track and made the proteas feel very uncomfortable. Zaheer khan took the wicket of Mark Boucher. He made only 1 before he was given lbw to a delivery that was going to miss the stump comfortably. Dale steyn looked in a attacking mode but Zaheer showed his experience as he bowled him a few bouncers before delivering a wide one that Steyn (10) edged and was caught by the third slip fielder. It was Prince and Harris who stayed on for a small partnership of 27 runs worrying India for a while. Harris was clean bowled by Zaheer at his score of 7 to break that partnership. Prince and Morne Morkel then stood firm for an hour, reducing the required runs. Ishant Sharma grab the wicket of Morne Morkel (20) as he edged the ball to Dhoni. Lonwabo Tsotsobe was last man out when he was run out by Pujara from short leg as he over-balanced out of the crease.